An active compound that makes chilli peppers spicy can reduce the growth of breast cancer cells, a study has found. Breast cancer is the most common cancer in women, according to the World Cancer Research Fund International. In 2012 about 1.7 million cases of breast cancer in women were reported around the world. Triple-negative breast cancer is an aggressive type of cancer and chemotherapy is the only available treatment for it. However, researchers from Germany looked into a new treatment approach on this type of tumour. 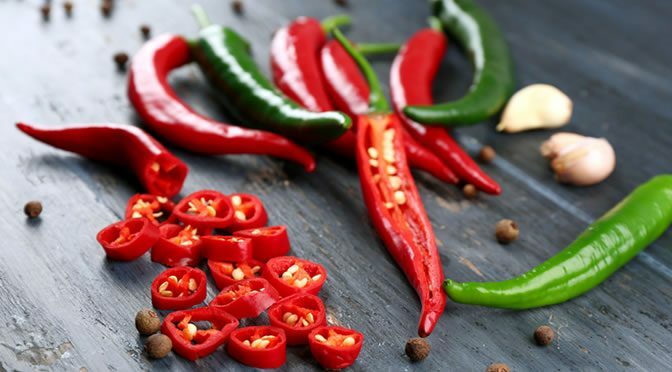 They found that capsaicin, an active ingredient of chilli or pepper, can stop the growth of these aggressive breast cancer cells. The research team detected several olfactory receptors (odorant receptors) in the cultivated cells. One of these receptors — called TRPV1 — occurred more often belongs to a group of ion channels –Transient Receptor Potential Channels. The researchers activated this receptor by adding capsaicin or helional (a scent used in laundry detergent and soap) to the cell culture. The activation made cancer cells divide more slowly or die in larger numbers and the surviving cells couldn’t move as quickly as before. This suggests that the tumour cells’ ability to form metastases in the body was reduced. The study was published in Breast Cancer: Targets and Therapy (Weber et al., 2016).